Nintendo has been very kind with numerous info drops and trailer releases in the past several months with regards to the Zelda remake. 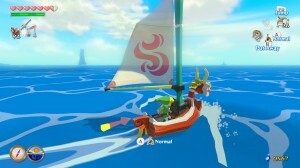 Good for both old and new fans alike, Wind Waker HD looks to be a reason for the holiday season, for any prospective Wii U buyer or potential owner. The game has had a massive visual overhaul, a re-balancing of features and difficulty, and most importantly retaining the solid game design that made WW an instant classic on the Gamecube. While we were just treated to a new trailer during the last Nintendo Direct, Ninty has seen it fit to release a handful of new eye popping visuals, presumably to prolong the salivation of Zelda fans the world over. This first one gives us a great look at how much work Nintendo has put into recapturing the vivid color scheme in the game. 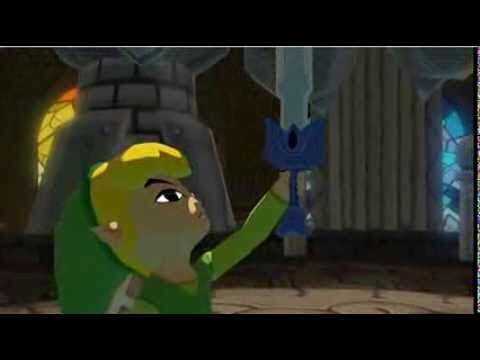 All of the HD visuals really bring out that sense of optimism found in Wind Waker, and are seen in every little visual facet throughout the title. This screenshot also reminds us we will indeed be able to sail across The Great Sea even faster, due to the newly updated and very appreciated speed travel the King of Red Lions has been imbued with. This next pic gives us a look at Link chilling on Windfall Island. The town is aptly named for its placement in Link’s journey, as it’s the first safe haven you find yourself carried to on the winds of your travels. Windfall was a go-to for fun and activity in WW at any given point, and will likely be a popular place to seek out when the remake hits. We’re reminded of the very quirky nature of Link’s facial expressions in this one, and how much life is brought to Link, by mere virtue of facial expressions. All in the small it seems. Next up is a sneak peak at the newly revamped inventory system, and the many tools Link will need during his windy travels. The Wii U gamepad will certainly make inventory management a snap, and the menu itself looks clean and easy to understand. 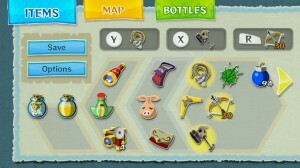 This screenshot is reminiscent of Skyward Sword, perhaps due to the combination of simple aesthetic and easy to find gadgets seen on the screen. Also, we get a glimpse of a new item, especially made for the HD remake called The Tingle Bottle.This new item replaces the Tingle Tuner (no GBA connectivity means no mulitplayer), and will act as the connection between WW HD and the Miiverse community on the Wii U. Using the Tingle Bottle, you can write and send messages to Nintendo fans all over the Zelda Miiverse community, and see what everyone’s talking about on their colorful travels. The Tingle Bottle and the Miiverse ties directly into this next pic, which shows us at how the Miiverse community itself will look for WW HD. The layout looks slightly snazzier than your average Miiverse, complete with Wind Waker visual touches, such as the paper map visuals making up the dialogue boxes which players will use to post comments. The first comment makes pleasurable mention of the new fast travel in the game, which I’m sure will be a topic of regular topicality. 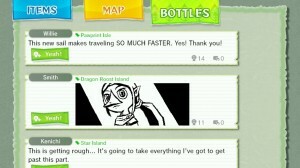 The Tingle Bottle isn’t just limited to messages however, as we see a high quality Miiverse drawing of Medli, a member of the Rito clan who helps Link in his travels. Ah yes, another picture of sailing on The Great Sea. 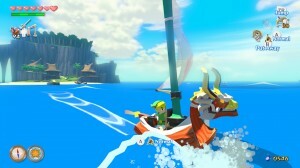 Wind Waker has a lot of aquatic travel involved, so seeing so many pics with Link cruising on the surf shouldn’t be all that surprising. Despite the sometimes longer travel times, I won’t deny the feeling of soothing that washed over me, whenever I let myself be enveloped by the waters. The sensation of sailing was an essential part of WW, and the action of sea faring is alive an well in the remake. Upon closer inspection of this screenshot, the upgraded visuals have really done wonders for the elemental effects of the experience. Trying to focus in on the foam on the boat’s bow, or the clouds in the sky above Outset Island, does a spot on job of creating a calm atmosphere. This last pic, and easily the most broody of the bunch, shows off some of Link’s fighting prowess found in his darker times of ocean traversal. 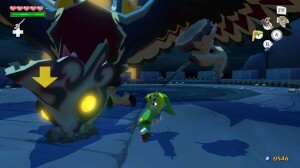 This particular battle happens later in the game, when Link finally returns to save his sister Aryll at the sinister Forsaken Fortress. This environment is a stark contrast to most of the game, representing perpetual darkness and a tinge of hopelessness. The enemy Link is fighting, is named The Hemlock King, and is akin to the mythological creatures of legend referred to as Roc’s. These fearsome beasts are gargantuan birds with wing spans that seem impossible to the human eye. Fittingly so, we see Link wielding an equally ridiculous weapon, one big enough to make our hero look desperate and determined all at once. From the look’s of this screenshot, the fight may be in its final moments. Link is raising the hammer on high as if to say, I’ve been working on the railroad, and The Hemlock King is about to fully understand the length of time a “live long day” is. 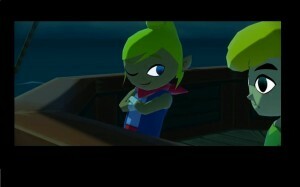 For anyone who still isn’t as excited for The Legend of Zelda: Wind Waker HD as I am after all of these pics, what’s up? Don’t like adventure games or something? Take one more look at Nintendo’s recent game play trailer, and be amazed at Zelda in all of its gorgeous glory. 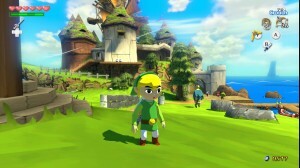 Wind Waker HD is slated for October 2013 exclusively on the Wii U. Are you ready to be The Hero of the Winds?